$172.50 worth of birds, any combination, to be released at your request. This plan is ideal for the hunter who wants to have a good time hunting 7 months or whenever possible. You'll take home a lot of game birds for the table. Membership includes one guest per hunt. There will be $20.00 fee for each additional guest. $975.00 worth of birds, any combination, to be released at your request. For entertaining a customer, client or prospect in a way that's different and impressive, you can't beat a hunt at a licensed hunting club. Membership includes four guests per hunt. There will be a $20.00 fee for each additional guest. A lot of game birds are released for the money. 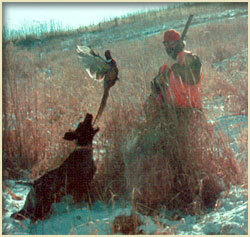 Individual hunting parties can hunt their preference or shoot any combination of birds. $172.50 worth of birds released. Charge is per person for a 4-6 hour hunt includes lunch. Visa and Master Card accepted. Processing fee on all cards. Must add 7% state sales tax.